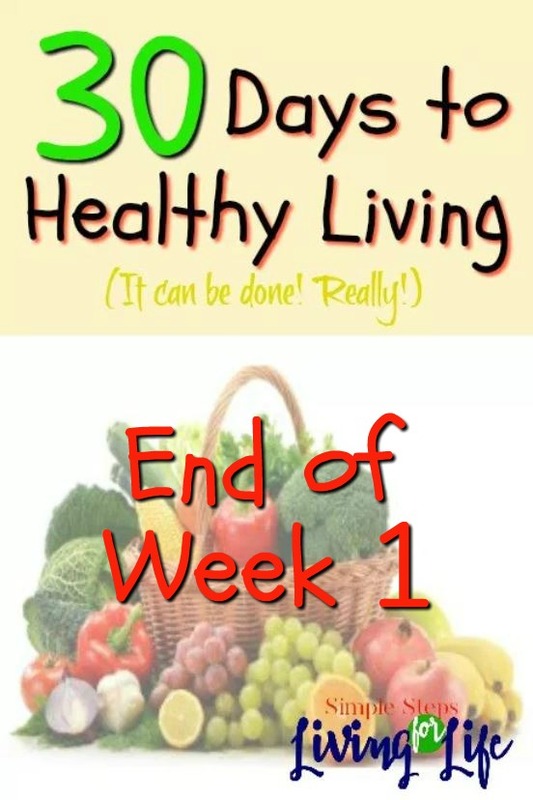 Today was day 7 on the 30 days to healthy living challenge. One week down with 3 to go. I’m actually already thinking about signing up to do the challenge again next month. The Facebook group is really helping me stay on track. I don’t interact a bunch on there but read what other people are asking and the answers etc. I also like all the informational things that are posted like how sugar affects people’s health and what grains are healthier and why. DIGESTION PLUS – I mix this slightly sweet slightly I don’t know what stuff into 4 ounces of water. and drink it quickly. SHAKE – Two scoops of chocolate protein shake with water. I’m glad I moved the greens balance to my vanilla shake for me it seems to go better with that one than the chocolate shake. Plus, like I mentioned before, it’s just wrong to mess with anything chocolate! DETOX TEA – I found around 2-2:30 each day that I’m getting hungry so the detox tea helps me with my appetite. FIZZ STICK – After getting home around 3:30 I’m a little hungry again by 4 and have my other fizz stick drink (LOVE IT!). This what has helped me kick my obsession with soda. QUINOA(1/2 cup cooked) & CHICKEN WITH VEGGIES – I made the Israeli salad recipe from the FB menu but decided to have the chicken, quinoa, and veggies more like a buffet on the table. My kids aren’t keen on being introduced to new foods – especially “exotic” foods like quinoa. LOL TIP: Rinse/wash the quinoa before cooking to remove the bitter taste. WATER – Water has been helpful in breaking my late night snacking that has been the biggest threat to healthy eating in my life. SNACK – I was feeling lightheaded so I ate 1/2 a cup of cooked quinoa and a 1/2 of a small cabbage. I know I’m a weirdo, but eating cabbage leaves is like eating chips to me. YUM! Plus, it’s healthy. LEFTOVER AVOCADO & CHICKEN SOUP – I’m loving the weekly meal plan and shopping list that is given in the Facebook group for each Arbonne 30 Day Clean Eating challenge. FIZZ STICK – The challenge allows for 2 fizz sticks a day. It’s a good thing there is a limit because I’d probably go through 4 or 5 a day if it weren’t for this rule. Around 2-2:30 I start to get hungry each day. Today was little harder for some reason so after I got home by 3:30 I had some snacks – quinoa and cabbage. It really filled me up and kept me going until dinner at 7pm. Other hiccups today, I was VERY tempted all day long: at work a co-worker offered me chocolate, while running errands with my kiddo they got all riled up which stressed me out and I almost ordered myself a deep fried carmel apple empanda. Somehow I didn’t cave. 4 days ago I would have ordered that, a chicken quesadilla, and a soda the size of my head. Thank you Lord that I didn’t cave. Now just 27 more days to make this habit a part of my always and forever way of life. PEAR – I think that fruits are somewhat of a no-no on the clean eating challenge plan. Not because they are bad or anything, but I am trying to break my sugar addiction. While fruit has naturally made (unprocessed) sugar, it’s still sugar. CABBAGE WEDGE – I like to eat cabbage (and lettuce) leaves like some people like to eat chips. I was super hungry this afternoon and ate the cabbage real quick. PORK CHOP WITH VEGGIES & LEFTOVER QUINOA(1/2 cup cooked) – I didn’t use the menu idea for this night because I was in a hurry to help my little girl get ready for the Daddy Daughter dance. VALENTINE MESSAGE HEART – When my daughter got home from the dance, she was so excited that they had the tiny hearts with messages on them as party favors and shared one with me. I couldn’t turn her down. COFFEE – I drove 3-1/2 hours to check on a family member in the hospital and didn’t get there until after midnight sooo I caved and drank coffee. Between that and chewing gum and my mom talking with me on the phone, I stayed awake and made it just fine. I was really worried about staying on track on Friday (Day 5). I brought my little bin of 30 Day Clean Eating Challenge items from Arbonne which helped sooo much! It also helped that by day 5 I had dropped between 3 & 4 pounds so I was motivated to stay on track. I followed the eating plan except for eating three small handfuls of almonds and having a very tough/chewy gingersnap since my family member was finally eating and offered me one. Obviously, being out of town meant I couldn’t cook my own meal. A day or two prior I had read a post in the facebook group about one of the members having to suddenly go out of town and was worried about eating well. Everyone just reminded her that our focus is clean eating as much as possible – limit processed foods and stick with veggies and protein as well as you can. That totally motivated me to order something on the healthier side at the McDonald’s drive thru. MCDONALD’S GRILLED CHICKEN SOUTHWEST SALAD (no dressing) – I really really love this salad. For me the dressing isn’t necessary because the chicken has lots of flavor and the extras on the salad do also. I didn’t completely eat healthy with this because the salad does include cheese which is a dairy product and it also includes a tiny bit of spicy chip like things. Never-the-less, it was a best option for eating on the go and coming close to eating clean (plus, it tasted SO GOOD). WATER WATER WATER I was super thirsty all night at the hospital and I surely flushed out some toxins with the crazy amount of water I drank! I drove back the 3-1/2 hours home and made it just in time to see part of the pinewood derby race that my little cub scout was part of and his siblings got to race as well in the “siblings class.” Was lots of fun but there were tempting treats available that I was able to turn away from. Also on the night of Day 6, my husband surprised our family with a fancy(to us) meal out to Red Lobster. It was hard SOOO HARD to stay on track when eating at one of my favorite chain restaurants! I did cave and had a cheddar biscuit. When I worked there this past year, it was one of the foods that would keep me going during my shift. Oh so yummy! RED LOBSTER FEAST! – Unsweet tea, a cheddar biscuit(I should have skipped this), lobster, shrimp, and salmon. It was delicious! I tried sticking with the clean eating challenge as best I could by requesting the rice to be switched out for broccoli. My kids ate the salad and broccoli (along with their meals) but I did eat all of the lobster, shrimp, and salmon. Isn’t seafood clean eating? Definitely. SHAKE – Had a tempting morning. My family asked for donuts for breakfast as I was leaving to get some things at Dollar General. At the donut shop, it was a mental struggle to not ask for one of the glazed heart donuts. Leaving empty handed for myself felt like a won a giant competition which I guess I did except I was just competing with myself. CASHEWS – I ate a small handful of cashews. After eating them I realized I wasn’t that hungry just the can was sitting there. I might have actually been thirsty but took it as a hunger cue. QUINOA(1/2 cup cooked), ASPARAGUS, SQUASH, AVOCADO, & TOMATOES – I should have included protein even though quinoa has it. Staying on schedule with my eating and sticking to the plan (or at least close) was easier than I thought it would be. There were days I was really tempted but turning to water helped me a bunch. It made me realize a bunch of times I thought I was a little hungry, I actually was thirsty. Also some emotional stress happened this week and usually I would turn to food for comfort. 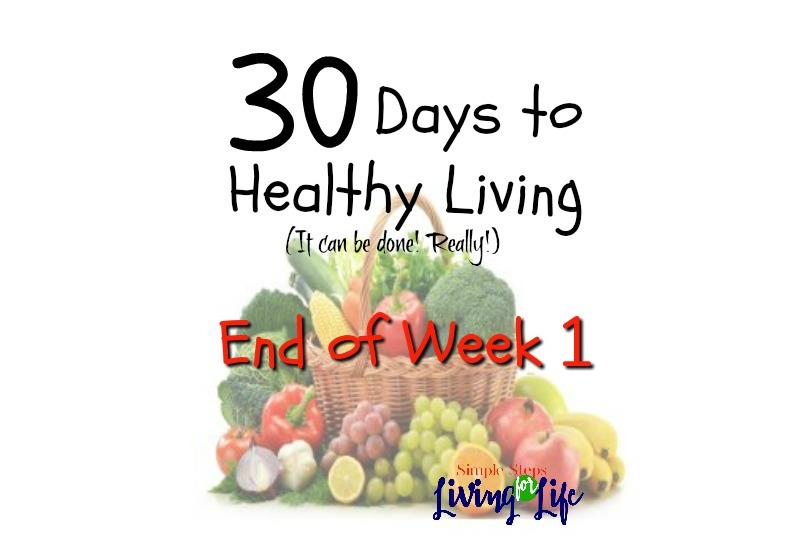 Being a part of the 30 Day Clean Eating Challenge helped me think before eating anything. It has made me be more conscious about what I’m eating and when. So far I’m enjoying the challenge, plus it doesn’t hurt that I’m down 5 pounds in one week and feeling great!